One of the sleeper hits of the Xbox Live Arcade era gets the sequel treatment it deserves in Marble it Up. The game serves as a spiritual successor to 2006’s Marble Blast Ultra, bringing the series’ unique arcade style platforming to the modern era on the Nintendo Switch. How well does it stand up compared to other similar games, such as Super Monkey Ball and the classic Marble Madness? It turns out it does an amazing job! Xbox Live Arcade brought us an armada of incredible indie games throughout its history. One of my personal favorites last generation was Garage Games’ Marble Blast Ultra. The last official game in the Marble Madness series, it captivated a generation of indie fans with its bright HD visuals and addicting high-speed platforming. Earlier this year, the announcement came that a super group of indie developers, including some who had worked on the aforementioned excellent titles, had formed to create not only a proper new installment to the franchise, but the ultimate marble platforming experience. I’ve been excited to see how the game would turn out, and I’m pleased to report that I’ve been having a blast. In Marble it Up, you take control of a marble and roll through a series of colorful 3D platforming stages. Those who played Marble Blast Ultra back in the day will be very familiar with the control scheme. However, novices need not worry, as the opening tutorial levels do a very good job of getting new players up to speed. The puzzles are organized into chapters, with each new chapter ramping up the difficulty from the last. While the game’s more difficult levels demand a great deal of precision from the player, even the more freeform ones from earlier in the game warrant second plays to try to beat your previous clear times. Multiple enhancements really separate Marble It Up from its competitors and it really shines with its huge variety of obstacles, power-ups, and creative objectives scattered throughout the levels. Although there is a clock ticking, the game provides some areas where you can move slowly through platforming-based puzzles. Other levels feature wacky gravity, and all of them feed the compulsive need to collect all of the gems hidden about. All of this is heightened by the incredible HD visuals, complete with colorful retrowave aesthetics and killer electronica soundtrack. While the new objective-based puzzles are welcome additions, the highlights of the game continue to be the series’ bread and butter, speed and momentum-based levels, which there is no shortage of. Marble it Up handles high-speed platforming segments incredibly well, arguably better than the previous endeavors of Sonic The Hedgehog. Speeding through the beautifully constructed geometric landscapes continued to satisfy my addiction. While there is a bit of a learning curve for handling the marble at slower speeds, it’s worth it for the endless amounts of fun to be had exploring the mesmerizing world. Running at 60 frames per second both docked and in handheld mode, it cannot be understated just how beautiful and aesthetically pleasing the art style for the game is. As you progress you unlock different skins for your marble and as simple as a mechanic as this is, unlocking them is very rewarding and you’ll be surprised just how many varieties of marbles there are for you to play. The biggest complaint is actually in the sound design as, unless adjusted beforehand, the sound effects of the marble rolling are high in the mix and can get a bit grating after awhile. It’s an incredibly nit-picky complaint, and one that’s quickly overlooked thanks to the game nailing the all-important joy-factor. Whether you’re playing for the first time, against the clock, or simply exploring each stage, the marble is simply fun to control. The realistic rolling physics combined with the less than realistic jumping and gliding powers offer a very fun 3D platforming experience. The premise is rather simple, but the developers executed flawlessly, creating yet another must-have Nintendo Switch title. 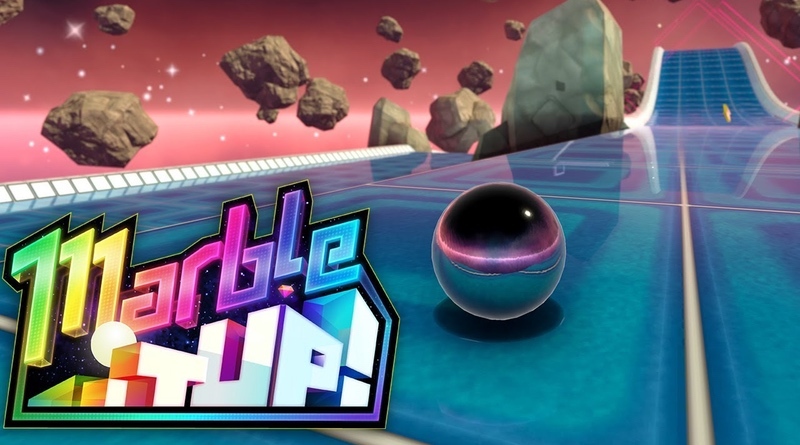 Whether you’re playing in short bursts on handheld mode, or taking in the awesome visuals on your TV, Marble it Up provides loads of entertainment value from start to finish. Indie fans and casual gaming fans alike will find a lot to love with this game. If the enticing graphics and soundtrack don’t hook you, the intuitive gameplay definitely will. Marble It Up! was reviewed using a final retail Nintendo Switch download code provided by the publisher. Evan Roode is a full time journalism student and amateur game historian. His favorite song from Guitar Hero III was “Even Flow”.